The White House is seeking to help Iraq's leadership prevent a diplomatic rift between Saudi Arabia and Iran from aggravating sectarian conflict in Iraq and undermining recent victories against the Islamic State (IS) group. In a phone call on January 6, U.S. President Barack Obama and Iraqi Prime Minister Haidar al-Abadi said they were both concerned about Sunni Muslim-led Saudi Arabia's execution of a prominent Shi'ite cleric, as well as attacks on the Saudi embassy in Tehran in retaliation for the execution this week. The incidents inflamed sectarian anger throughout the Muslim world, and Iraq is particularly vulnerable to the upsurge in conflict between the two Muslim sects. 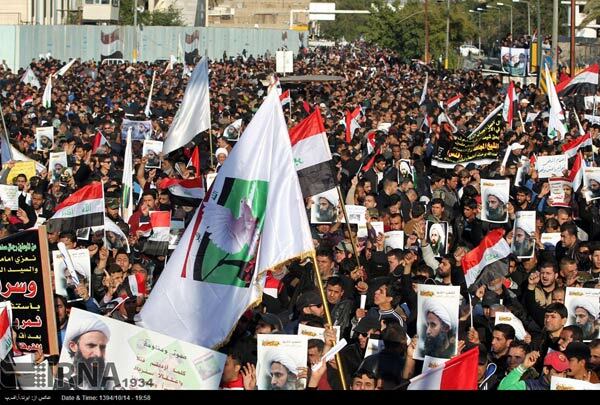 On January 6, for the third straight day thousands of Shi'ite demonstrators poured into the streets of Baghdad and cities in the south of Iraq where Shi'a predominate, demanding that Iraq shut down the Saudi Embassy in Baghdad, which reopened only last month after being closed for 25 years. The demonstrators carried the flags of the three most powerful Iranian-backed militias -- the Badr Organization, Asaib Ahl al-Haq, and Kataib Hizballah. "If our demands are not met, we will take escalating measures," said Hajj Jawad al-Tulaibawi, a spokesman for Asaib. "We say to Abadi...he who leads needs to have a strong heart and be brave," he told Reuters. "If he can't, he should leave." But Abadi so far has resisted the demands of his Shi'ite power base. The White House said he and Obama agreed "on the importance that all parties maintain diplomatic engagement and dialogue." The Saudis had reopened their Baghdad embassy only last week after closing it in 1990 to protest former Iraqi strongman Saddam Hussein's invasion of Kuwait. Abadi has called for a "wise, responsible, and rational" response to the Saudi-Iranian rift. As a Shi'a, he is under pressure from Iraq's Shi'ite majority, but he also has sought to enlist the support and confidence of Iraq's sizable Sunni minority, which resides mostly in areas of the north and west seized by IS militants in 2014. IS forces swept through the Sunni regions, capitalizing on resentment to the Shi'ite-led government in Baghdad headed by Abadi's predecessor. Winning back the confidence of the Sunni population has been critical for Abadi, who has framed the war against IS as a campaign against terrorism rather than a continuation of Iraq's decade-long Sunni-Shi'ite conflict. His approach scored its first major success in the final days of 2015, when the Iraqi Army, backed by Sunni tribal forces and an international air strike coalition, dislodged the militants from the center of Ramadi, the capital of the western province of Anbar. Until then, it was the Iranian-backed Shi'ite militias that had led the fight against IS. They were kept from the battlefield in Ramadi to reassure the Sunni population. Obama spoke with Abadi about the Ramadi victory and offered to intensify support for Iraqi forces as they seek to consolidate their gains in Ramadi. The Iraqi and U.S.-led coalition forces face further fights this year to try to recapture control from IS of Iraq's second-largest city, Mosul, which also is Sunni-dominated. Iraqi Foreign Minister Ibrahim al-Jaafari noted the "wide-ranging repercussions" for Iraq and the entire region from the Saudi-Iranian row on a visit to Tehran on January 6 in which Iraq offered to try to mediate the standoff with Riyadh. "We have solid relations with the Islamic Republic [of Iran]...and also we have relations with our Arab brothers, and therefore we cannot stay silent in this crisis," he said. While Iraq is caught to some extent in the crossfire between the two regional powers, Jaafari said Baghdad's place in the heart of the Middle East also affords it a role in trying to "alleviate tensions." "This responsibility has been given to us and we have been active from the early moments to lessen tensions to prevent a disaster from happening that could affect the entire region," he said. "I have spoken to the foreign ministers of some of the Arab countries to reduce the consequences of this issue and prevent enemies from dragging the region into a war that can have no winners," he said. The White House said Obama backs the Iraqis in calling on all parties to show restraint and avoid further inflammatory actions.